The end of the year is always a good time to reflect back on what we've accomplished and where we've been, so we can see where we're going. 2018 was another good year for IGIS, with a number of notable accomplishments and new initiatives. Our 5-year Program Review which began in January 2017 wrapped up in early 2018. VP Glenda Humiston wrote in her conclusions from the review, "IGIS is a very important service for academics across UC ANR as well as a bridge for ANR to access cutting-edge geospatial data, tools, science, and research." She indicated that "IGIS should focus on expanding its capacity and reach with drones (both people and equipment)", which we have done. Our new Drone Technician and Data Analyst, Jacob Flanagan, has streamlined our drone data acquisition and processing workflow, enabling IGIS to significantly increase its capacity for drone services to ANR and its affiliates. And, of course we gained a new GIS Wunderkind with the birth of Eleanor Johnson! DroneCamp 2018 was a huge success in San Diego. This has become our flagship training event, and one of the most comprehensive short courses on drone regulations, operations, and data analysis found anywhere in the country. This year we almost doubled our capacity by splitting up flight instruction (the instructional bottleneck) across two days, which worked great thanks to amazing support from our local host, the UC San Diego Environmental Health and Safety. Every year our training curriculum improves, and this year's program included visits to the UCSD DroneLab and the Wide Angle Virtual Environment (WAVE) facility. It will be hard to top UC San Diego as a venue (but we'll try in Monterey for Drone Camp 2019!). Thanks to Jacob's help, this year we captured over 6,500 acres of drone imagery (~2.6T data) all over California. Our largest drone project this year was a massive mapping mission at HREC after the River fire burned over half the property in July. 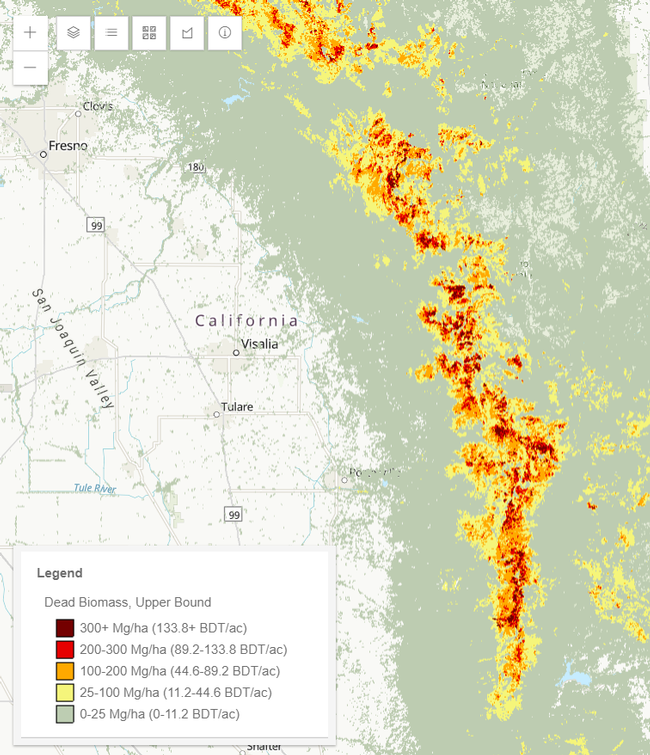 We mapped nearly 3,500 acres in both RGB and infrared to help researchers understand fire dynamics and ecology, and collected a dozen aerial 360s over burned areas. We were able to complete such a large mission in part due to our new fixed-wing eBee drone, which has almost double the flight time of our big quadcopters. In addition to the many research projects we support through GIS services and drone data collection, members of the IGIS team were authors on several excellent papers that came out in 2018. Visiting graduate student Ovidiu Csillik developed a workflow to detect trees from drone imagery using machine learning in eCognition, with imagery from Lindcove REC. Kelly Easterday's review of digitizing historical data, with a highlight on historical HREC research reports and the use of Machine Learning to pull information from scanned documents. This is Shane Feirer's excellent modeling work on Ixodes pacificus (ticks) in CA in collaboration with Prof. Bob Lane and the CA Department of Health. UC Berkeley grad student Chippie Kislik did an excellent review of the use of drones for algal bloom research. We continued our long partnership with the Geospatial Innovation Facility (GIF) at UC Berkeley, and the UCANR California Naturalist Program to build the Climate Adaptation Clearinghouse. This flagship project created a one-stop-shop information portal for climate adaptation, led by the Governor's Office of Planning and Research. 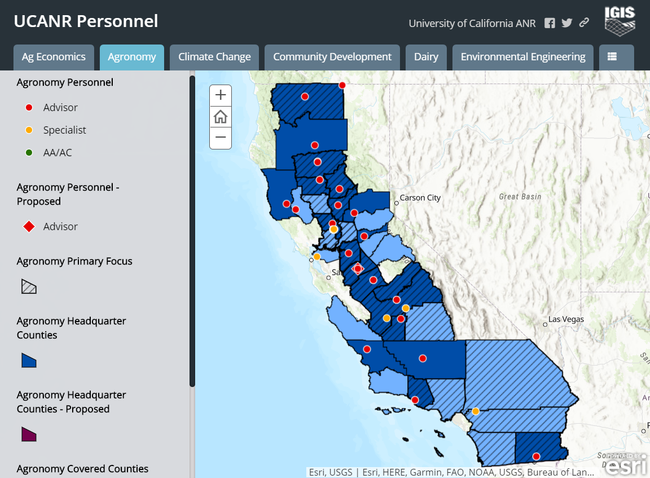 IGIS developed a custom Story Map template to view climate adaptation stories from around the state, as well as an administrative interface that will allow OPR staff to continue to maintain and update the content. 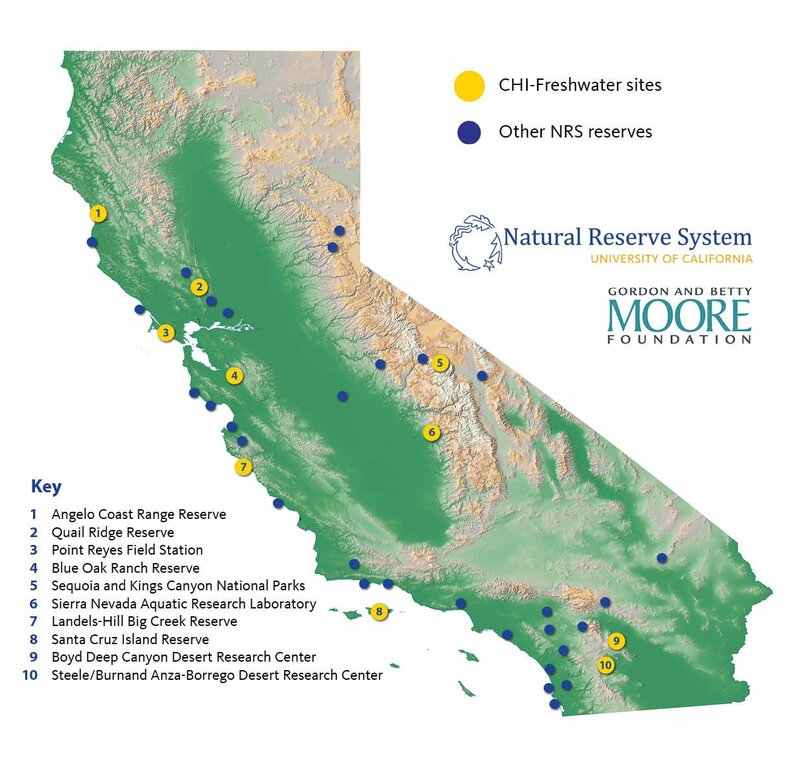 We also began a new collaboration with the UC Natural Reserve System (UCNRS) and their California Heartbeat Initiative (CHI), involving drone data collection across 10 of the NRS reserves as part of a multi-year, multi-site study on water-soil-vegetation interactions. The results will not only help us understand how California's ecosystems will respond to a changing climate, but we also enhancing the toolkit of data collection and analysis methods. We partnered for the first time with The Wildlife Society Western Section and NRS Hastings Natural History Reservation to offer a customized version of our DroneCamp curricula tailored for biologists. Complemented by drone pioneers in wildlife biology, and representatives from the CA Dept of Fish and Game and USFWS, the formula worked extremely well. We like collaborating on intensive multi-day trainings, because it allows us to concentrate on the curricula, meet drone experts from other fields and organizations, and get help with the many moving parts a multi-day training involves. We're please to repeat the Drones for Biologists training in April 2019. We were also extremely excited to launch a multi-year collaboration with the Karuk Department of Natural Resources and UCANR Specialist Jenny Sowerwine. The project title is a mouthful, "Karuk Agroecosystem Resilience and Cultural Foods and Fibers Revitalization Initiative: xúus nu'éethti – we are caring for it", but the essence is a series of research and capacity building activities by the Karuk tribe on cultural food and land management practices, and environmental monitoring. Our piece will be seven GIS workshops, drone flights, and research support over the next three years. We love the long-term and highly interdisciplinary nature of the initiative, and the first two workshops on Story Maps and 360 Photography went great in October 2018. Much more on this in 2019. 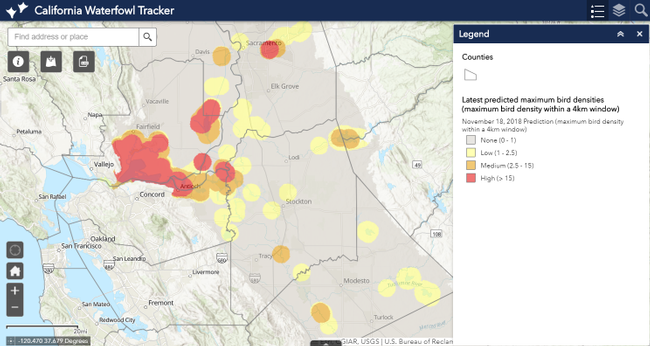 We created a webapp called the "Waterfowl Tracker" for Maurice Pitesky from UC Davis VetMed, showing real-time estimated waterfowl density in California's Central Valley. Designed to help poultry producers know when wild waterfowl are in their area, the app analyzes satellite data with a machine learning algorithm on a daily basis, and overlays the results with historical NEXRAD radar data and waterfowl habitat. It's a good example of how web GIS can bring the latest science to producers. A dead tree biomass webapp allows you to visualize and download the estimated biomass of trees that died from drought and insect attack in California between 2013 and 2017. Under the hood, this webapp showcases the work of UC Berkeley graduate student Carmen Tubbesing, and is another good example of using technology to bring science to the public. We made numerous enhancements to CalLands, a webapp that highlights land ownership and the distribution of cropland and natural habitat in California at the county and parcel level, for Specialists Luke Macaulay and Van Bustic. Providing training in GIS, data collection, and data analysis has been at the core of our mission since 2012. Our training program has evolved as technology and needs change, and we continue to refine how we support the UCANR's network in an increasingly data-intensive world (stay tuned for a survey on workshop preferences). We continue to teach in-person workshops on Introductory GIS, both desktop and web based. 2018 was also the year we officially migrated all our GIS workshop material to ArcGIS Pro - the successor to ArcMap which is going away. It's not that bad! If you'd like some handholding making the transition, see what's coming up on our training page. 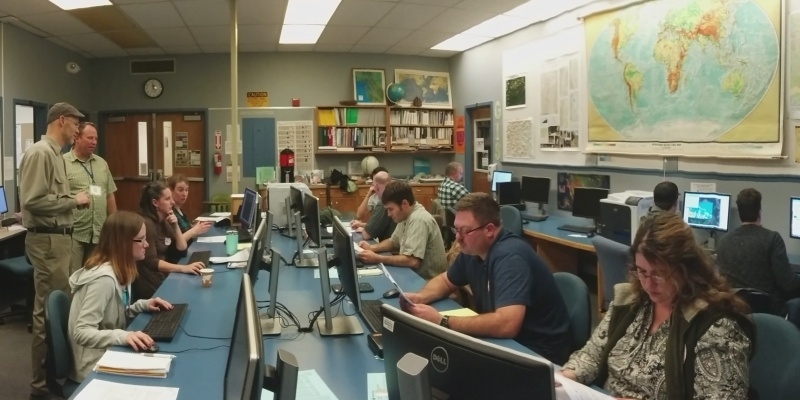 Responding to a demand for higher-level GIS skills, we taught workshops on Spatial Data Analysis with R, GIS for Professional Foresters, LiDAR Data Processing, and Drone Technology for Biologists. As more and more people come to the workplace with basic GIS skills from college or grad school, we see the demand for advanced and applied trainings to continue. We added a new workshop to our portfolio in 2018 - Immersive Visualization with 360 Photography. Our inaugural offering of 360 Photography was for the Karuk Department of Natural Resources, who are looking at 360 photos to accompany an environmental monitoring program. Like other geospatial technologies, 360 hardware and software have advanced by leaps and bounds in the last few years, but there are still many moving parts to using 360 photography effectively for research and extension. It's a lot of work to create a brand new workshop, but the hard work paid off and we see a lot of potential for this moving forward - virtual tours of RECS, bringing ANR clientele to the field, environmental education, etc. We continue to partner with collaborators in our training programs. In fact, all but one of our workshops 2018 were conducted with partners, including Shasta County UCCE, GreenValley International, The Wildlife Society Western Section, UCSD Environmental Health and Safety, the UC Berkeley Geospatial Innovation Facility, and the Karuk Agroecosystem Resilience and Cultural Foods and Fibers Revitalization Initiative. We continued to increase our online support programs, which are growing slowly but surely. We saw a steady pickup in our online office hours, and made extensive use of Zoom for all kinds of Tech Support. We also ventured into webcasting, streaming two workshops on YouTube and Zoom, both which went well and continue to benefit people via the recording. Online training works great for specialized technical topics, and we'll continue to develop these formats in 2019. Helping tell ANR's story is one of our favorite program areas. California is huge and the work of land grant institutions is inherently complex, but geospatial technologies give us powerful tools to convey the reach and impact we're having. More of this to come in 2019! 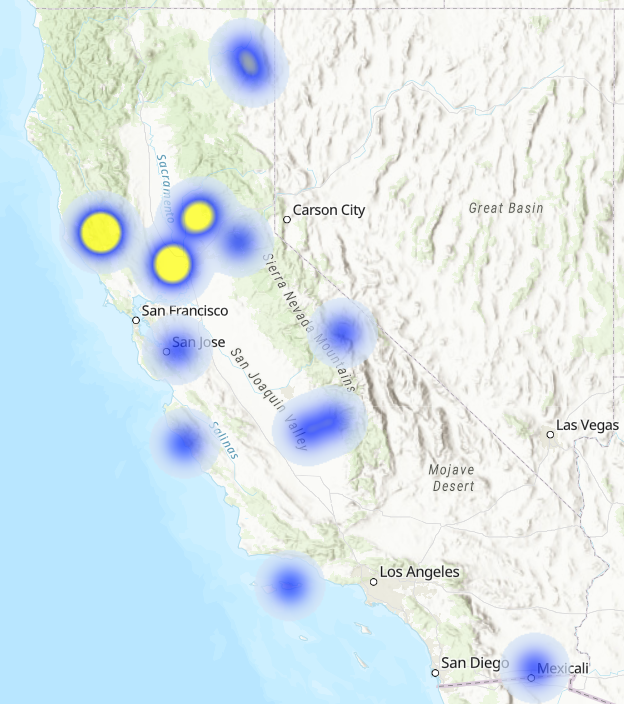 We built the UCANR Footprint webapp and underlying data to visualize the academic footprint of Advisors and Specialist in California. The breadth of the our distribution is impressive, but the webapp also reveals areas where more academic staff and funding are needed. 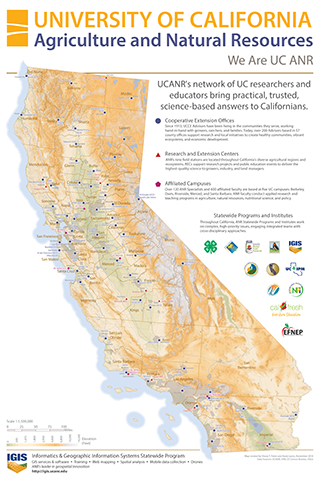 We also designed a new wall map of the UCANR system, showing not just Cooperative Extension offices and RECS but also descriptions of four programmatic components of UCANR and logos of the Statewide Program and Institutes (can you name them all?). Next time you have a question about ANR's work at the local and state level, this is a good place to start. By early 2019, we're hoping every ANR office in the state has a copy of the map. 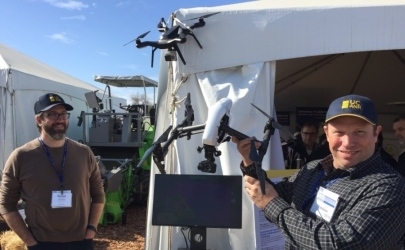 We continued our participation in ANR tent at the 2018 World Ag Expo talking to visitors about ANR programs and drones in agriculture. The World Ag Expo is one of the highlights of our year, and we'll be back in 2019. None of this could have been possible without the help of a long list of collaborators, and phenomenal program support from UCANR. We'd like to thank everyone who helped make 2018 such a productive year, and all the best in 2019!